Whether you’re making connections in a business conference, participating in a tradeshow, or looking for a quick way to exchange contact info when in the store, you’re going to need to print business cards. But not just any business card will do. Your cards, after all, are an extension of yourself and your business. You will need to make your own cards and show people what you’re all about. A lot of time, effort, and creativity goes into designing business cards. We’re offering a number of custom shape options, coatings, and paper types to help meet your needs. 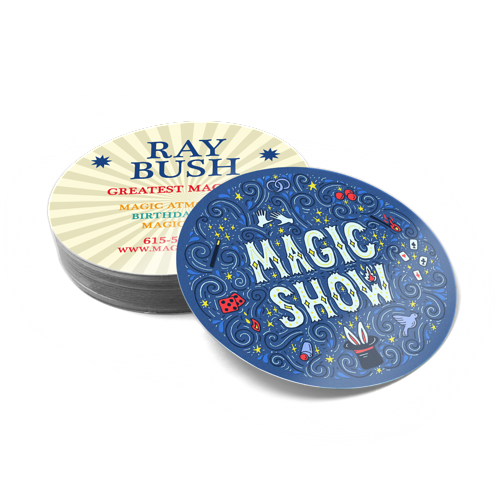 Our business card printing also comes in a number of size options including the most popular ones: 2” x 2”, 2” x 3.5”, and 2” x 3.5” rounded corners. 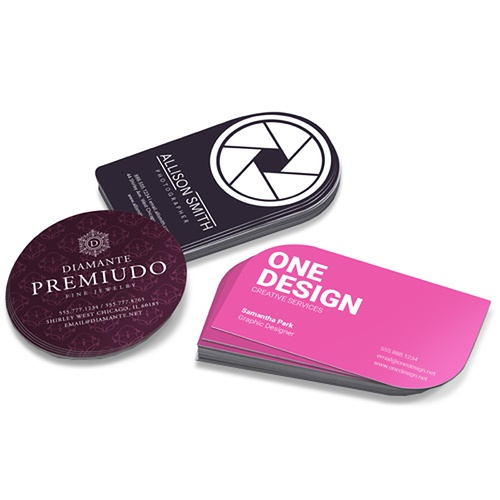 Our custom business card printing allows you to create designs tailor-made to your needs, whether you want the standard business card size, 2” x 3.5”, or another size. For something a bit different, try square or rounded corner cards. If you would like to stand out, check out our circle option. If you want something truly custom, try our die-cut cards for a personalized look and feel. For a more upscale look that will highlight your brand, go with our foil business cards.Our uncoated option adds a rustic feel to your card with the additional functionality to write on them. Finally, if you would like to cram in as much information as you can, try our folded cards. No matter which you choose, you’ll have the option of getting your business cards ready for shipping as early as 1 to 2 business days.